Electro industrial noise this is very much like many of the bands that Cop international , Wax Trax , Invisible and Reconstruction gave us in the 90 with a healthy mix of NIN more Pretty head machine period. They have elements of Bands like Six Finger Satellite , 16 volt , Pigface and Bauhaus. I even hear elements of Swedish master minds When in what they do. 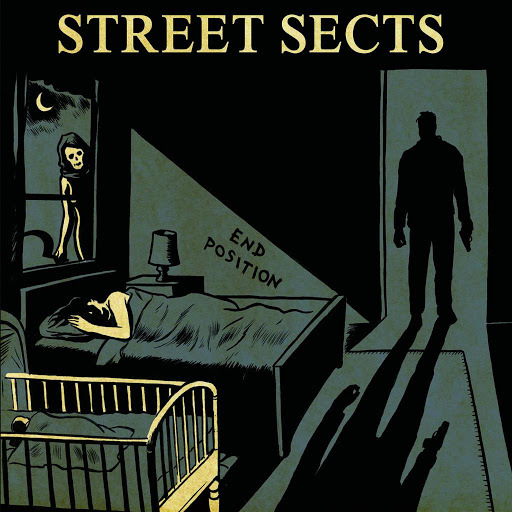 This is pissed off electro industrial and we don't have a lot of good material these days and Street Sects is just that a good industrial band in a time were it's needed. Very impressive to say the least check this out . I know very little about the band other then reading that the band is " viper " in Finnish. The music is a mix of Punky Black metal meets Death rock. Imagine for a moment if Killing Joke and Dead Kennedys went Black metal that is the full on feeling you get listening to what KYY is presenting . Brutal and Raw but that Gothic Punk thing really gives the band that edge that others don't have. It's noisy as hell at times as well. There is what I would call a toxic melody to this not buried but out there just enough to make you wonder if you have heard this band before . KYY has the early Northern European Black metal style in them and you know it early one. Sometimes emotion is really what you need to drive an album and this has it in spades.. This much more of the Heavy Prog and Space rock meets metal side of Devin. Still epic and heavy but way more experimental, outsider and left of center. Devin is much more painting a canvas of sonic layers with this album. The Melodies are so strong and haunting with this band. The harmonies are like nectar dripping off the pedal of a flower in the early morning light. This is for fans of bands like Ayeron, Porcupine Tree and Dan Swano's Nightingales . Transcendence is a massive labor of love and sounds more like a theatrical piece then a traditional rock or metal album. You can feel the passion behind this album. Devin voice just gives me chills and I hope this to never change I love that every project he does under a specific name is very different sonic ally but at the heart of it all you know its a Devin Townsend creation. I just know I look forward to every release and savor end one the same. Another Gem with Transcendence..
Eibon has a strong love for cold wave, synth driven, fragile music sung often in Italian . I want to call this Jazzy Post Rock mixed with the above mentioned music. There is a very electro world music vibe to everything that Wanda Wulz creates. They love that old Cold Meat Neo Industrial sound too. There are times I even hear bands like Puissance and Monumentum going on here. You can feel the hear break in this music. You you like The Cure or This empty flow as then you have a direction to go with bands like Portishead too there is a Trip rock element going on in the layers of this album too. As I said bands on Eibon are so much more a part of the whole and you need to sit with them and let them take your mind to where it needs to me. Stellar just stellar. A female and male fronted avant rock, electronic, epic orchestral nightmare in a dream is what I hear. Mix Jazz, Electronica, Triprock, R&B, Noise , Theatrical , Industrial Black metal and that just begins to tell the story. There are occult and art rock too. This album is madness in audio format as much as the name of the band, They remind me of Kontrust, Mr Bungle, Dead Fashion Disco and Julie Christmas all in one. What else can really be said other then a musical mental break down is wonderful from time to time and I will be listening to this a lot as this band calms the voices in my head and that says ALOT !!!!!! Happy Halloween Six Six Six new reviews !!! !